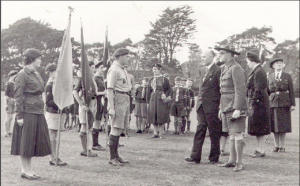 After the Experimental Camp on Brownsea Island in 1907, Scouting was deemed to have started. Baden-Powell published “Scouting for Boys” in 6 fortnightly parts from January to March 1908, boys all over the country read them and were excited by the ideas and information they contained, so they formed themselves into “patrols” and then found their own Scoutmasters. In July 1909 “Associations” were being formed in each of the districts of London and soon after in almost every town in the Country. Troops and Packs were registered locally at first by the District (or Association) Secretary, then from 1919 until 1928 they were still registered separately but by Imperial Scout Headquarters. From 1928 Imperial Scout Headquarters collected together Packs and Troops with the same name, re-registered them all as Groups, gave them a Headquarters registration number and also a number within their District. 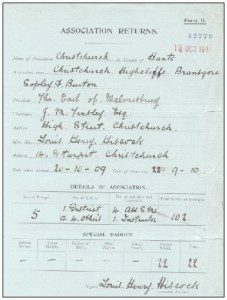 The Christchurch Association was formed on the 20th October 1909 and the Warrant dated 22nd September 1910. In the Association Return, dated 18th October 1911, there were 5 Troops and 102 Scouts in the Association with The Earl of Malmesbury as President, J.M. Tinsley Esq Chairman and Louis Henry Hiscock of 14 Stanpit, the Honorary Secretary and also Scoutmaster of the Mudeford Troop. However, a report in the Christchurch Times of the 4th February 1911 refers to a report, dated 12th December 1910, which states that there were 4 Troops in the District with 82 Scouts, 4 Scoutmasters and 2 Assistant Scoutmasters. It is probable that these 4 Troops were 1st Christchurch Troop, Mudeford Troop, Bransgore (St. Mary’s) Troop and Sopley (St. Michael’s) Troop and the 5th Troop formed was 2nd Christchurch, later known as the Fairmile Troop. Then in 1911 the Highcliffe (General Stuart Wortley’s Own) Troop was opened. In the Headquarters Gazette dated March 1911, under New Troops 26.1.11 to 22.2.11 the 7th Christchurch (Cottage Homes) is listed with R. Blakeborough as Scoutmaster and 24 Scouts. As this is the one and only mention, in either the Headquarters Gazette or “The Scouter” of the 7th Christchurch (Cottage Homes) it may be that the Troop which opened in 1910 called the 2nd Christchurch and the 7th Christchurch (Cottage Homes) were amalgamated. In 1928 the 2nd Christchurch re-registered as 2nd Christchurch (Fairmile) and said they met in the Cottage Homes. The Cottage Homes was a children’s home administered at that time by the Christchurch Union Workhouse. The Workhouse, now mainly demolished, was part of the hospital in Fairmile Road and the Cottage Homes was on the opposite side of Fairmile Road. The earliest District Meeting on record was on the 4th January 1915. Mr J Tinsley was Chairman, Mr F. Abbott the Honorary Secretary and Messrs. Barnes, Blakeborough, Tottle and Sellwood formed the rest of the Committee. The first bank statement on record is for the year ending June 30th 1912 with the Capital and Counties Bank Ltd (later to become Lloyds Bank Ltd). The cash paid in was 13/6, the expenditure 1d charges, leaving a balance of 13/5 (about 67p today). Although it is reported that the Highcliffe Troop was closed at some time there is no proof of this, although it was reformed in 1924. Sopley (St. Michael’s) is not mentioned after 1914 until 1946 and 7th Christchurch (Cottage Homes) probably amalgamated with 2nd Christchurch. 1920 The November issue of “The Scouter” reports that warrants were issued to 2 people in the Heron Court Troop. 1921 The August issue of “The Scouter” reports that a warrant was issued for the 9th Christchurch (Cranemoor) Pack. 1922 The December issue of “The Scouter” reports that warrants were issued to 2 people in the Christchurch (Congregational) Troop. 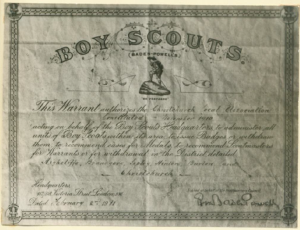 1923 The August and September issues of “The Scouter” report that warrants were issued to 2 people in the Burton Parish Troop. A Scout Troop was registered under the name Jumpers and Iford. 1924 The August issue of “The Scouter” reports that a warrant issued to Christchurch (Congregational) Troop had been cancelled. The September issue of “The Scouter” reports that a warrant issued to Heron Court Troop had been cancelled. 1927 The May issue of “The Scouter” reports that a warrant issued to 9th Christchurch (Cranemoor) Pack had been cancelled. Headquarters registration of Thorney Hill Cub Pack, Headquarters Thorney Wood, Cubmaster Mrs A Fortesque and 9 Cubs. 1928 All existing Groups were re-registered by Headquarters. Headquarters re-registration 3419 Thorney Hill. 1930 Thorney Hill Group listed as closed. 1933 Headquarters registration 9th Christchurch (Cranemoor) as a School Troop. 1935 The October issue of “The Scouter” reports that a warrant issued to 12th Christchurch (Walkford) Pack had been cancelled. 1936 Headquarters registration 11th Christchurch (Rover Scout Crew). 1937 Headquarters registration 12th Christchurch (Walkford) Group. 1938 Headquarters registration 13th Christchurch (Avon Valley) Group. Town, Fairmile, Jumpers, Highcliffe and Avon Valley. Reports are muddled but it is possible that boys from Burton, Bransgore and Sopley kept going as the 13th Christchurch (Avon Valley). 6th Christchurch (Bransgore). Listed as closed by Headquarters in 1939. 8th Christchurch (Burton). The Group is not listed in the Hampshire County Register in 1937. It is reported that the Group closed because there was a lack of leaders. 9th Christchurch (Cranemoor). There is no further mention of this Group after 1937. 10th Christchurch (Mudeford). Reported to have closed. This Group was re-registered in 1946. 11th Christchurch. Closed because people of Rover age went (Rover Scout Crew) into the forces. 12th Christchurch. There is no further mention of this Group (Walkford) after 1939. This picture, taken in 1958 shows the then Mayor of Christchurch Councillor Ken Smith with District Commissioner Mr. A. Carlos inspecting the 16th Christchurch (St. George’s) Group under the leadership of Ken Old. As a result of prompting and encouragement given by Councillor Eric Spreadbury, the Scout Band was established in 1976. In the early years they entered the Youth Band Competitions and were placed 11th out of 48 bands and in only their second year their Drum Major, Mark Milton, was awarded third place. Over the years the Band has taken part in many carnivals and fetes and also led the local St. George’s Day Parades. Unfortunately, because of a lack of new recruits and the loss of several older members, the Band had to close for a period of 18 months. They were then reformed, with Guides and Brownies included for the first time and after a short while had built a good band once again. One highlight was having the honour of performing at Horseguards Parade and marching down The Mall in the Youth Bands Parade for the Queen’s Birthday. Following an inaugural meeting in 1978 it was agreed to form a Fellowship within the District, some 15 members joined and a committee under the chairmanship of Bill Cratchley was formed. There would be two categories of membership: Full membership – open to uniformed members and those who wished to make the Scout Promise and Associate membership. In the early 1980’s Bill Cratchley retired as Chairman and his place was taken by Ken Hart, who had previously been a member of the old B.P. Guild and was also heavily involved with the Scout Holiday Homes Trust. So it was not long before the Fellowship became involved with meeting the bookings, cleaning and close season maintenance of the caravans and chalets that the Holiday Homes had at Naish Farm. Before the Fellowship became involved with the Holiday Homes Trust, their duties consisted of just a few District events but once they became established, calls for assistance began to grow in number and a programme of events was formulated for the year. In 2009, Fellowship was renamed to Scout Active Support, and its acronym caused much humour. The SAS continue to support district events, section activities, and fund raise. They have a strong social element too. In 2001, The Scout Association made many changes to scouting sections to make them more relevant to the new Millenium. Rover Scouts provided by Groups, was replaced by Explorer Scouts provided by Districts and and Network Scouts provided by Counties. By 2011 there were 4 explorer units and in 2014 a local Network unit called Saxonii was started. Shortly after that, changes to the Network programme meant it became part of Christchurch district too.